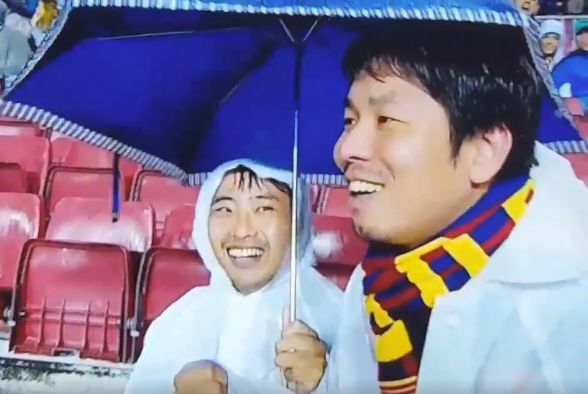 Check out these two Barcelona fans cheering after Gerard Piqué was sent off in their 3-1 Champions League group stage win over Olympiacos at the Nou Camp on Wednesday night. Identified as possible tourists pleased by the attention, the pair may also have been confused as to who the red card was awarded to as the camera focussed in on them both. Seemingly delighted however, and despite being drenched by the rain, they went wild for viewers of the television coverage at home.